The Sanctum Secorum podcast plumbs the depths of Appendix N as it applies to DCC RPG. Each show reviews one piece of Appendix N media — be it literature or film — and then discusses how to bring aspects of it to the table for your DCC game. We explore how the selected piece might already easily fit into particular modules and DCC settings, and we highlight one specific DCC module that really ties into the Appendix N material. Enter the Sanctum Secorum… and be inspired. Get the free Sanctum Secorum #17 Companion here! “A Night in the Lonesome October is narrated from the point-of-view of Snuff, a dog who is Jack the Ripper‘s companion. The story reveals that once every few decades when the moon is full on the night of Halloween, the fabric of reality thins and doors may be opened between this world and the realm of the Great Old Ones. When these conditions are right, men and women with occult knowledge may gather at a specific ritual site to hold the doors closed, or to help fling them open. Should the Closers win, then the world will remain as it is until the next turning… but should the Openers succeed, then the Great Old Ones will come to Earth, to remake the world in their own image (enslaving or slaughtering the human race in the process). The Openers have never yet won. These meetings are often referred to as “The Game” or “The Great Game” by the participants, who try to keep the goings-on secret from the mundane population. Welcome to the Sanctum Secorum podcast. No storm can breach the Sanctum Secorum’s walls and once again the doors open to give shelter and to provide enlightenment. 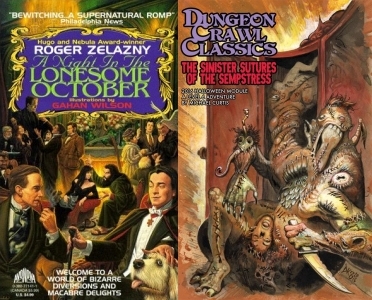 In this, special length anniversary episode, we prepare for Halloween with a work by Roger Zelazny. In addition, we have bonus content to bring to your DCC RPG table!